As reported elsewhere, Joanna Montgomery, 25, of Newcastle, UK, set out to develop a new product that would connect couples who are physically apart. 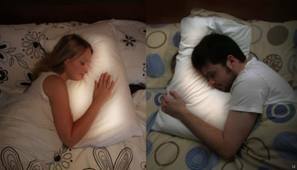 Pillow Talk enables couples to feel closer by transmitting their heartbeats – and by lighting their pillows with a glow. While they may be hundreds of kilometres apart, the two partners are connected through a wristband and a smartphone app. The wristband picks up the wearer’s heartbeat and transmits it via Bluetooth to the iOS or Android app. The other wearer immediately receives, and hears, the other’s heartbeat. “By plugging in your headphones or the pillow speaker, you can lie in bed and hear the real-time heartbeat of your loved one,” Montgomery says. The Internet-enabled pillows also glow in the dark. When one person puts their head down on their pillow, it sends a signal over the internet to light up the other person’s pillow. The result, Montgomery adds, is an intimate interaction between two lovers. Pillow Talk is currently in beta testing and due to be launched later this year. But it’s already received hundreds of orders. Her inspiration derived from her digital interaction design degree at Dundee University in Scotland and personal experience with her own boyfriend, who works away every four weeks on a ship in the North Sea. Maybe Naija University students sef go begin produce something worth our attention on this blog, at least from their research works.